Osteoarthritis also known as degenerative joint disease is a chronic disorder of joint cartilage and surrounding tissues that is characterised by pain, stiffness, and loss of function. As the cartilage wears away, the body lays down calcium deposits on the ends of the bones, causing dog joint pain, discomfort and limiting the range of motion of the joints. 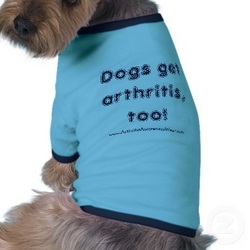 Arthritis affects 1 in 5 dogs in the US. Dog arthritis is common in older dogs that are overweight and inactive because their joint health has deteriorated over the years from wear and tear. Most dog breeds can get arthritis however it is the larger breeds that are more susceptible eg: Labrador retrievers, golden retrievers, German shepherds, Newfoundlands and St. Bernards. Conversely, certain breeds that have long been bred for speed or athletic ability, such as performance borzois and racing greyhounds, almost never develop arthritis. · Omega-3 fatty acids can be used as apreventative for arthritis as well as a treatment. Omega-3 fatty acids play an important role in many bodily functions. They control inflammation and maintain joint health. Omega-3 fatty acids reduce inflammation and slow down cartilage damage. A study done at Cardiff University in Wales found that omega-3 from cod liver oil was able to reduce the amount of enzymes produced that can damage the cartilage in human patients. Plus, it also showed a reduction in the enzymes that cause joint pain. Glucosamine sulphate is one of the safest and most widely-used remedies for arthritis. It helps rehabilitate damaged cartilage by stimulating the production of glycosaminoglycans (GAGs) and chondroitin sulphate, the essential component of cartilage. Glucosamine has also been shown to have anti-inflammatory activity, which helps to relieve some of the joint pain the dog may be suffering. Chondroitin sulphate is another natural medicine found in the body and it works to prevent enzymes from degrading the building blocks of joint cartilage. Chondroitin sulphate is often used in combination with glucosamine, however, when used alone, glucosamine sulphate helps the body to manufacture its own chondroitin. Methylsulphonylmethane (MSM) is often recommended by veterinarians for animals with joint conditions. The sulphur in MSM can be utilized by the body in the formation of compounds such as glucosamine and chondroitin sulphate, as well as the amino acids methionine and cysteine. Arthritic joints often have low levels of both sulphur and cysteine. Animal studies have found MSM helps to maintain normal articular cartilage. Green-Lipped Mussel, or Perna canaliculus, contains protein, minerals, glucosamine and Eicosatetraenoic acids (ETAs). ETAs are a type of Omega-3 fatty acids and provide an anti-inflammatory effect which helps reduce joint pain. Research in both humans and animals have shown that perna mussels have been effective in managing degenerative joint disease and arthritis. Human patients receiving perna mussels reported less pain, joint stiffness and improved mobility. The number one and most common homoeopathic remedy for arthritis is Rhus tox. Many homoeopathic vets have suggested that dogs respond best to a 200CH potency. Rhus tox is indicated if the pain is worse on initial movement, ie standing from a sitting position. However pains are better with continuous slow motion. As soon as the dog is at rest the pains will return. All the symptoms are better in warm weather or for applying warmth and they are made worse by cold weather. Bryonia is indicated when joints are swollen. Pains are made worse by any movement even the slightest shift in position. Everything is better when lying absolutely still. Pulsatilla is indicated when the dog is irritable from the pain. The pain shifts from joint to joint. The parts are extremely sensitive and the dog will probably not allow you to touch him. They are usually worse at night and in warmth, and better in cold. Zeel® is a homoeopathic complex remedy produced my Heel® which contains a variety of homoeopathic remedies in various potencies. Zeel® provides relief of mild to moderate osteoarthritis symptoms. Zeel® helps lessen pain and stiffness while improving the functionality of joints and cartilage, it is safe to take in conjunction with other medications and it has rare instances of side effects. Contrary to what many people think, exercise is vital for dogs with arthritis. It should start out as gentle exercise to get your dog’s joints moving and progressively increase it as your dog’s fitness levels rise. Try gently massaging your dog’s painful joints to help restore the blood flow. Just like us, a dog’s painful joints may become inflamed in cold weather so a good bed in a warm room will help your furry friend get a good night’s sleep. As with any illness, it is very important that your dog be checked by a vet. These recommendations are only suggestions and cannot replace treatment by a vet. However they can be used in conjunction with other treatments. ​Various Eye Infections in Dogs, Cats – Natural, Herbal Treatments, Remedies - this article lists all the different eye infections and also suggestions for natural treatments - really good. 5 Ways Turmeric Can Help Your Dog - this marvelous spice can do a lot more than just be used for cooking - both for dogs and humans.